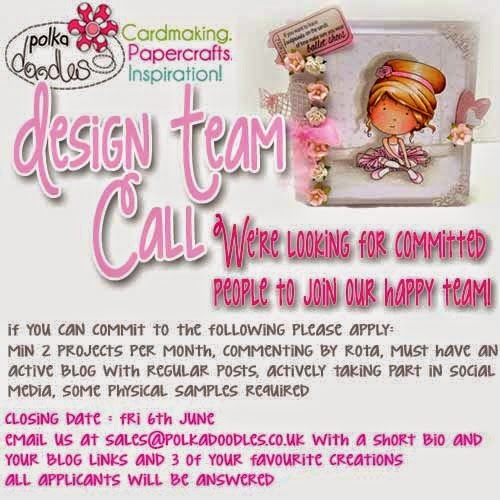 Welcome to the start of a new challenge here at Polkadoodles. so you can create anything for the men/boys in your life. You have until noon GMT on Friday 13 June to enter this challenge and we will announce the winner on Friday 20 June. The winner of this challenge will receive a copy of our Work & Play 1 Collection - fantastic prize worth £11 and includes 10 digis and 60 papers plus sentiments and a load of other stuff too! The winner and top 3 for our Week 20/21 challenge, Things with Wings, will be announced next week. 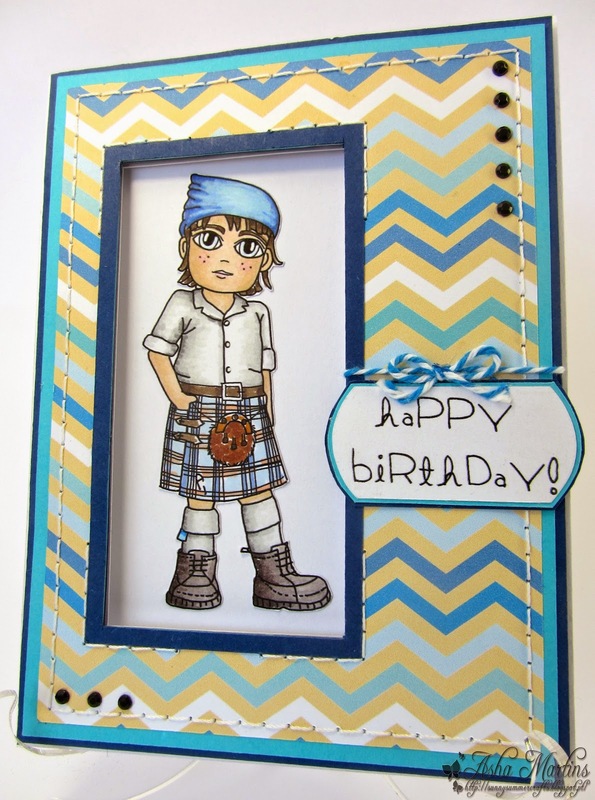 Asha - I made a birthday card using the Scottish boy named Jack, papers and greeting from the BonBon Belles CD. I coloured the young man with Graph'It and Promarkers and adhered him on the inside of the card, to be seen through a window on the card-front. In keeping with the butch theme, I'm using some black bling and twine to finish the card. You can also buy Jack as a single digi from Nikki's Etsy Shop. Karon - Birthday card, cowboy style :-) I have used an image off the Work and Play 3 collection, coloured with my alcohol markers. 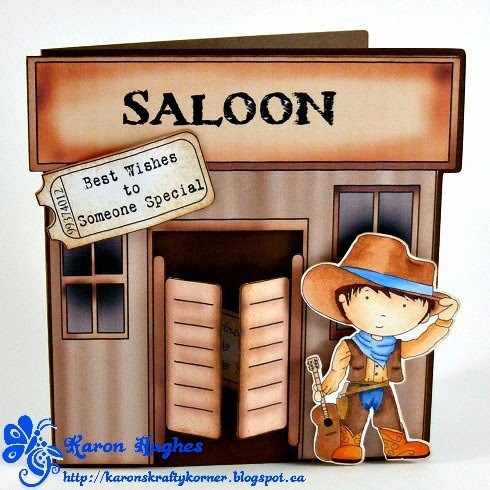 Then I used the pre-coloured image of the saloon (also off the CD) to make a shaped card. I did two layers of the saloon so that I could snip open the swing doors and have hidden another sentiment behind the doors. Lou: I have made a card for my Dad using Work and Play 3 as the image was just perfect. A simple layout from me letting the image and sentiment take centre stage. I have coloured my image using Promarkers. and add you entry to Mr Linky below. Well, hello there and welcome to another challenge Friday at Polkadoodles! What a bargain - that's buy 2 get one free!! - the offer ends midnight Monday so don't miss out! Also don't forget that it is Polkadoodles 5th Birthday this month and we are still celebrating. 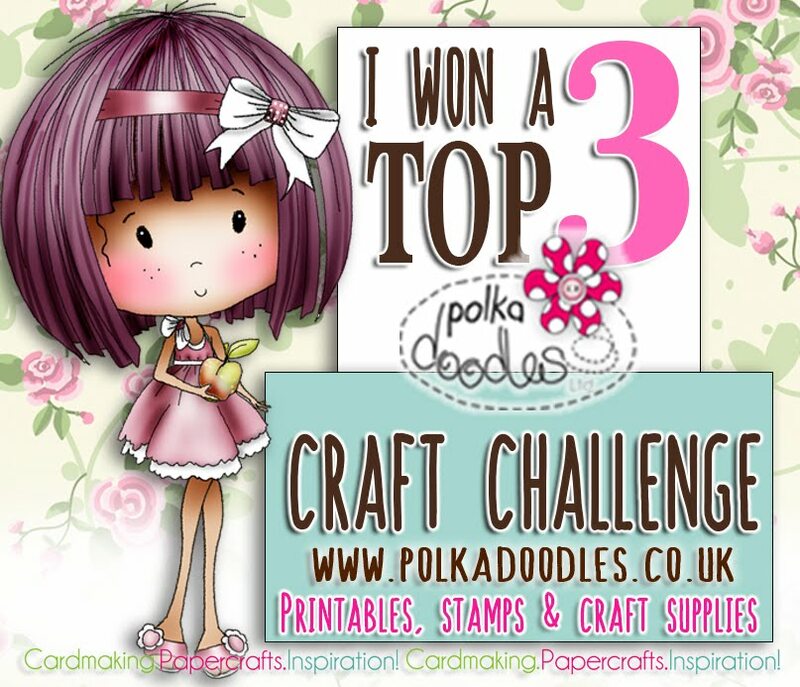 You have until the 30th May to go along and take part, for a chance to win £100 of Polkadoodles Candy. WOW! The winners of our Something Old/Something New challenge can be found at the end of this post. 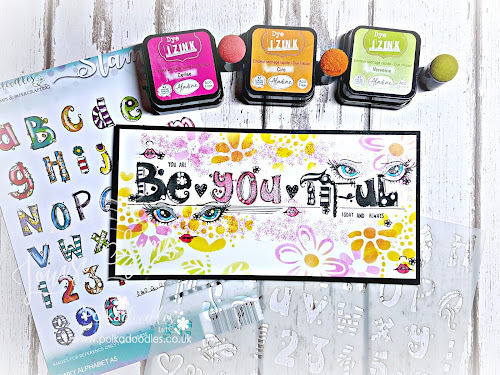 Ruth: I've used papers from the Fredericka cd - both the pretty butterfly and the spotty paper. I also printed the butterfly paper onto thick card and cut out some of the butterflies and layered them up, adding wire and a pearl as I went. 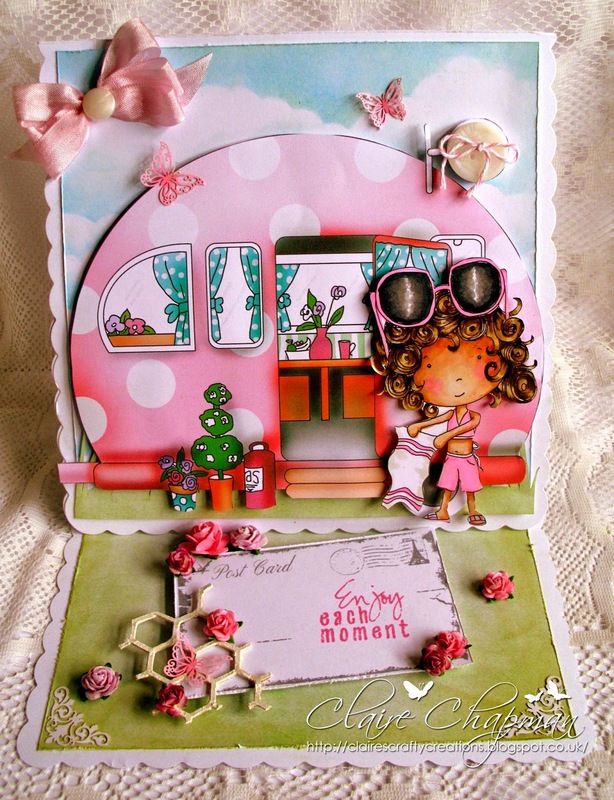 Asha - Here is a step card featuring Meeshelle from the Fairy Flutterfly rubber stamp series. I coloured the little fairy with Graph'It and Promarkers. The sentiment and elements are also from this stamp set. I heat embossed the butterfly on vellum. The beautiful butterfly patterned papers are from the Bonbon Belles CD. Some ribbon, a few bling and this girly card is done. Karon - Things with Wings, what will you come up with this week. I decided to use Fairy Flutterfly Gracie for my card in a box, this week. She is wonderful little set of 5 stamps. The large butterfly behind Gracie is also from this set. I have used papers from the Fredericka Mini Collection CD, and also the other colourful butterflies are from the Dollie Daydream Goes East Collection. Gracie is coloured with some water based inks on watercolour paper. Lou: I have used the butterflies from 3 of the Fairy Flutterby stamps sets to create my card. 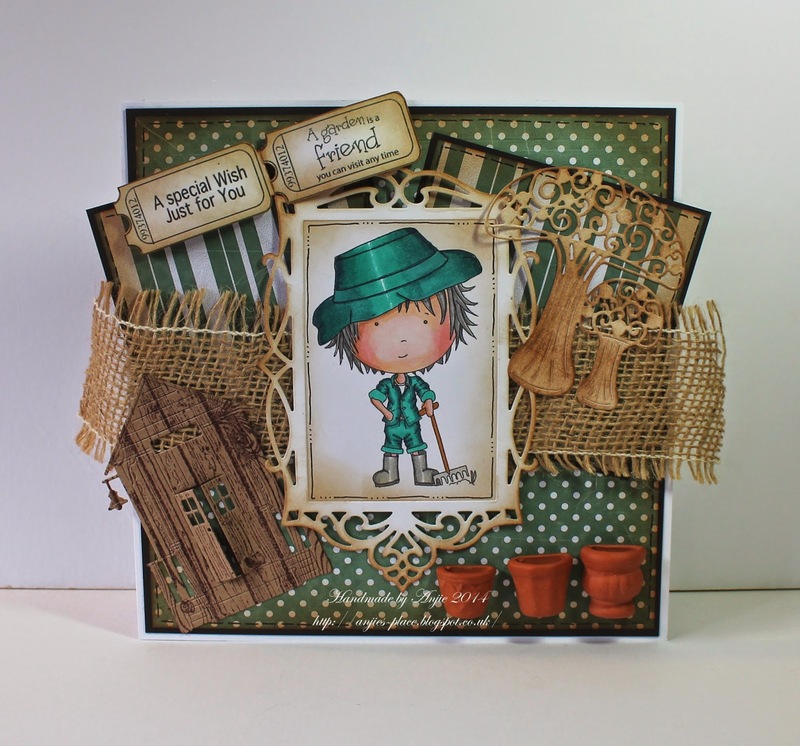 My card is a homage to Nikky after seeing a recent demo she did on Create and Craft. I have coloured the butterflies with my pan pastels and added glitter highlights using my GraphIt Shaker pens. 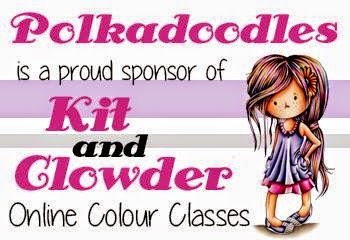 (Did you know that these sets are now on sale in thePolka Doodles shop with a whooping 50% off)! Well done everyone! Thanks for taking part, please grab your blinkies from the sidebar! Now off you go and get busy crafting. don't forget the Birthday candy too, HERE. Welcome to another Polkadoodles challenge! Firstly, don't forget our FREE CANDY and blog hop is still open and you can get all those fantastic freebies if you haven't already hopped with us! We're surprised we don't have more entries for all the lush stash! ENTER HERE!!! Our latest release of Work and Play is shipping now so make sure you don't miss these collections, they are so fabulous! This is Number 4 which is the latest in the collection and these images are also available in the download store too so you don't have to wait for the postman! Make sure you check out the store this week there are loads of new products including some amazing stamps you will ADORE! The winner of this challenge will receive their own choice of 4 digis from our Work and Play collection and our Top 3 winners will all receive a digi each too - great prize!! We will announce the winners of our week 18/19 challenge next week, so in the meantime let's get to the good stuff and see what the team have come up with this week - you are going to be WOW'd!!! Susan For this challenge I have used Sundae of Seasons CD...All the papers and embellishments are from the Summer section on Sundae of Seasons. I have made a plant pot and a topiary tree and cut out lots of sun flowers from the paper then stuck them to a paper ball and added lots of cute little bees, bee hives and honey pots from the embellishments. Bev here with my take on this week's challenge. 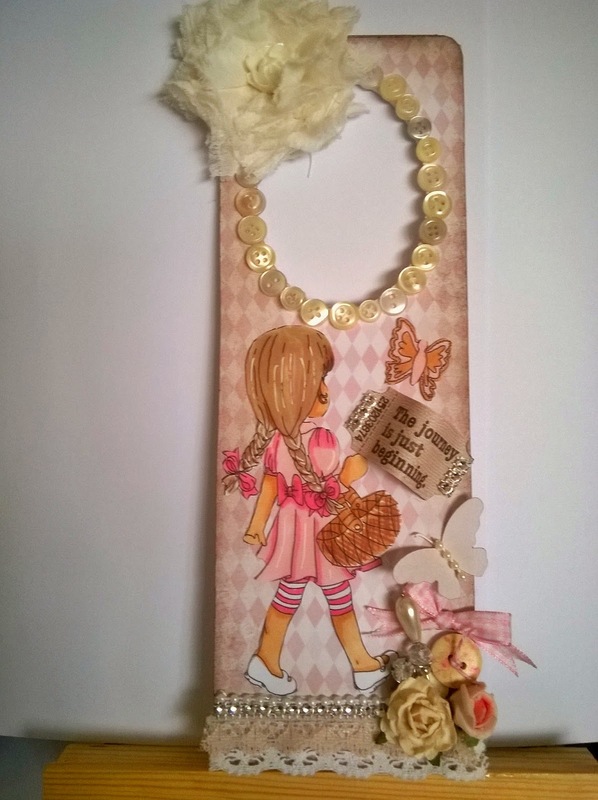 I just love butterflies and fancied doing something a bit different so made an inspirational wall hanging using Bonbon Belles cd rom - seriously you need this double disc in your collection its jammed packed! With lots of wonderful sentiments too. Claire C I love this week's theme and had loads of fun colouring up this gorgeous image from A Double Sprinkle of Kraft with my Graph'It Markers and adding lots of little butterflies die cut from the backing paper. 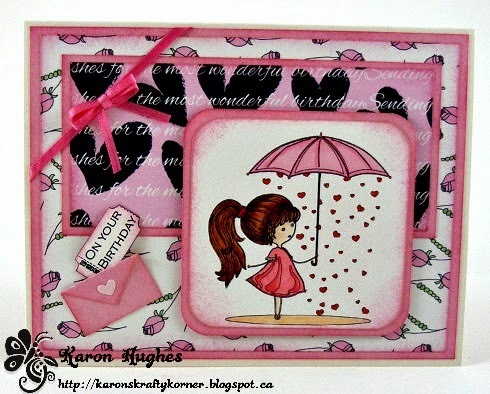 The backing paper and sentiment are from another favourite Cd, Dollie Daydream Girl Talk Collection. So where's the wings you are asking! They are on her arms, water wings! The cute image is from the Work and Play collection CD 4 which will be in the store soon! She is coloured with Graph'It Markers. 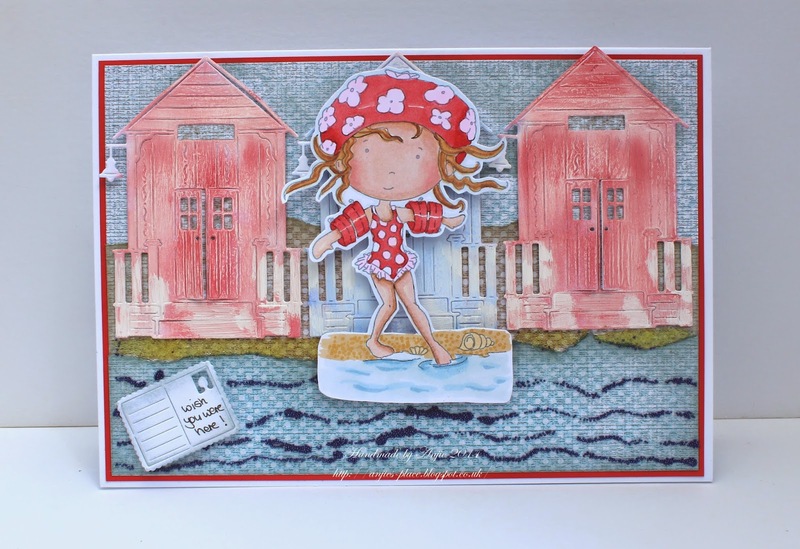 The papers are from the Wonderland CD-Rom and the die cut beach huts are from Tattered Lace. To get the distressed effect on them I painted them with White Gesso and then used Pan Pastels over the top. Then I have sanded them and then added a touch more Gesso on the railings. I think the effect is great, give it a go! For the sand and sea I have used some micro beads I have had in a drawer for years! 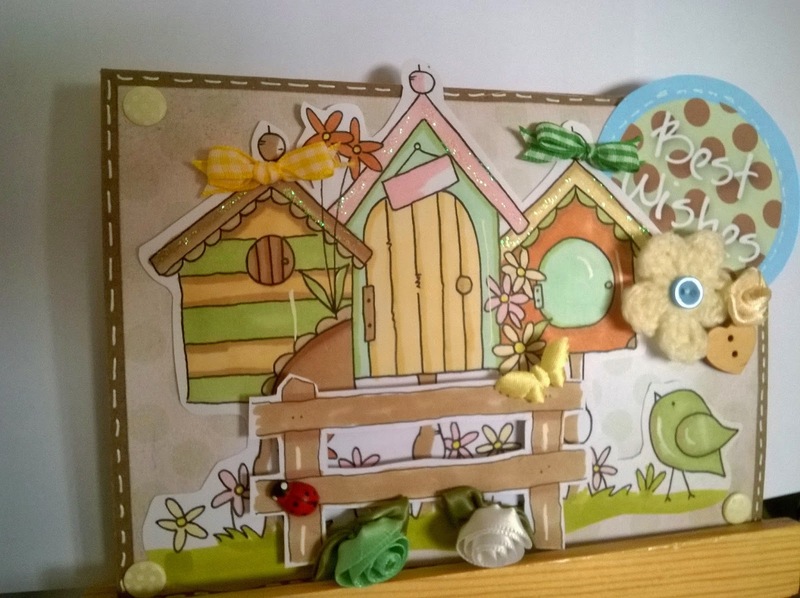 Lou: I have used Sugar Birdies for this week theme and created a round card with lots of round layers! Even the plain coloured card has been printed from this CD as there is a FAB-a-roo section on there of plain designs (which have a linen effect to them once printed). These plain designs co-ordinate perfectly with th epatterened papers and images. Hi everyone and welcome to another Polkadoodles Friday! 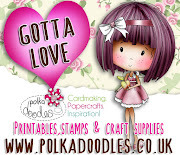 If you're very quick today you'll be able to watch Nikky on Create and Craft at 8am today, Fri 9th May with a fab Polkadoodles TV show for you, so tune in now and you might just catch it! (if you do miss her you can also catch her at 10, 3 and 7pm today too with some fabulous stamping shows! )....and don't forget that you can still enter our 5th Birthday blog hop so make sure you scroll down the page to the next post if you didn't already get all your FREEBIES! The winners of our last challenge will be announced at the end of this post. Don't forget the new Work and Play Collection 4 is available now and these collections are a fantastic, affordable way to build a whole library of characters for every occasion you could ever need! Bev here with your mid way reminder. So pop on over and join in with our 'Something Old, Something New' challenge. I used the papers and border from It's Not For Girls for something 'old' and for the 'new' a couple of digi's from Work & Play 4 which I've coloured in with my Graph'it Markers. It just goes to show that you can mix and match across the board over at Polkadoodles. and the image is from Work and Play 1. Anjie - The image I have used is from the Work and Play Collection 2 CD, which is also available as an instant download. Or you can just buy the Gardener image by itself. The papers are the "old" element on this card and they are from the Pretty Tuff CD Rom. The garden shed it made my using a wood effect stamp on kraft card and then I've used the Tattered Lace beach hut die. I think it makes it look like a garden shed, don't you? The mushrooms are also from a TL die. The little plant pots are real terracotta and were given to me by my friend in Spain who rescued them from going in a bin as she knew I would use them! What stunners from the DT!! Well done everyone! Thankyou all for entering and playing along with us, please grab your blinkies from the sidebar! You have until noon GMT on Friday 16th May to enter this challenge and we will announce the winner on 23rd May. 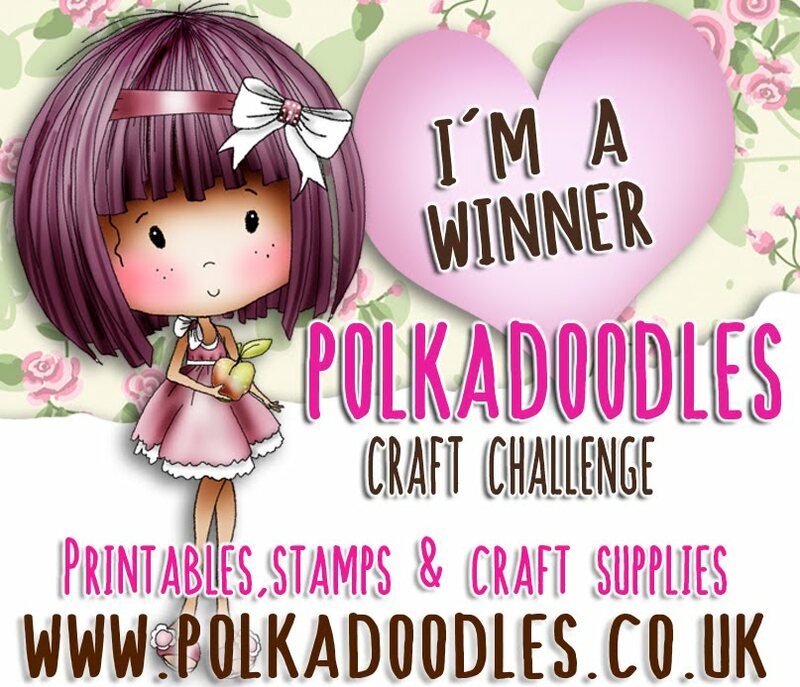 Dont forget you dont HAVE to use Polkadoodles products to enter the challenge, but please just make sure you follow our rules in the sidebar. WOOHOOO!! HAPPY 5TH BIRTHDAY TO US!! 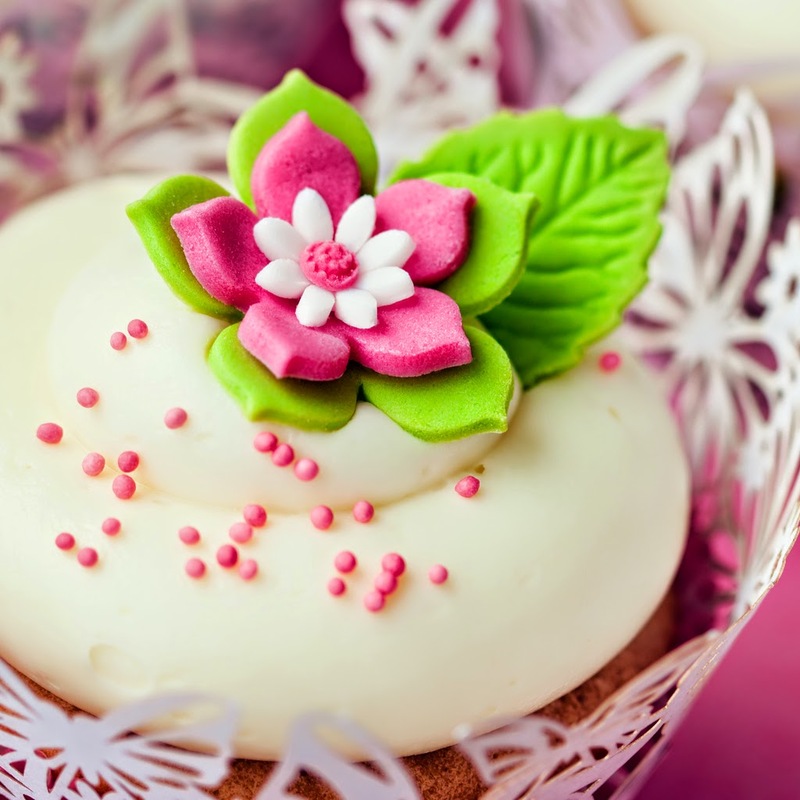 Hi everyone and welcome to May - and the beginning of our Grand 5th Birthday Celebrations! 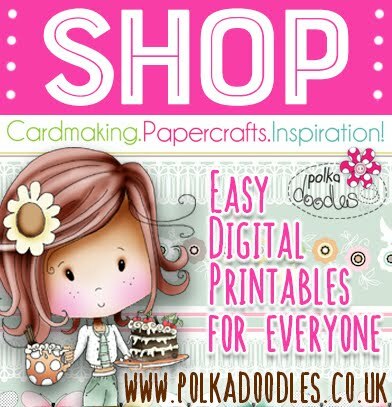 Yes, Polkadoodles was born this week back in 2009 and this month we are celebrating a whole 5 years of crafting inspiration here at PD towers. We have some great things lined up for you so make sure you pop in to see us every Friday during May, we have some little surprises along the way! So how time has flown - 5 whole years!! Oh my goodness!! I had a little look back at our first makes from the team the other day and you know what, they still look amazing now! I think this goes to show how our designs are classics and have a real longevity to them and also is testament to the fact that we are always bringing you designs and products which are bang on trend but also very often ahead of the field and it shows how usually we are way ahead of everyone else at spotting what is going to be new. Here we are, still amid a really great frenzy on owls and birds everywhere, yet our very first collections 5 years ago were all about that trend! Take a look at what the Design Team made this week back in 2009.... awesome huh? then check it out HERE because there is LOADS of candy and freebies up for grabs!! Don't miss it! Anyway, let's get to challenge business! and this can be almost anything! You have until 16th May to enter this challenge which will close at noon GMT. You don't have to use our products to enter, but we'd love it if you did. The winner of this challenge will receive a great download bundle which will include 5 of our Work and Play Downloads - great prize and worth £11.00! Sally - Hi! 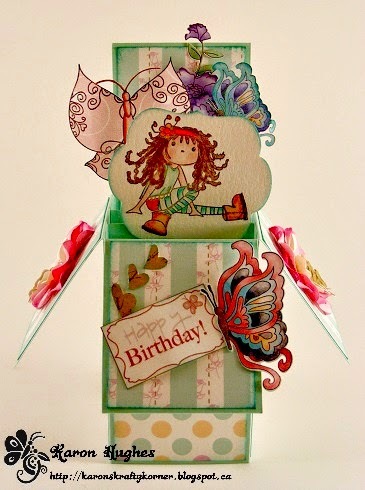 I chose to do a baby pop up box card. I used the images and papers from Sundae of Seasons CD Rom. 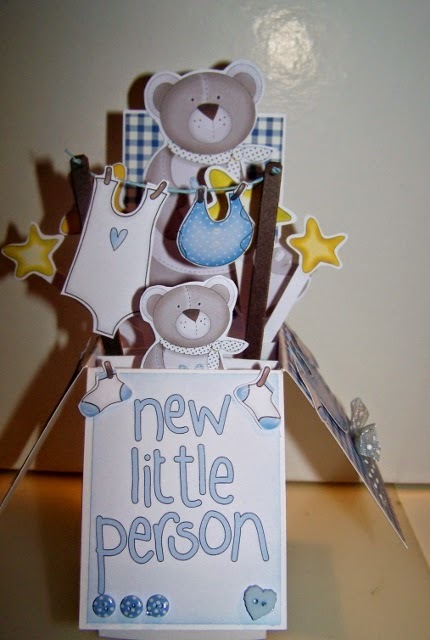 I thought the Teddy image is something old and the New Little Person sentiment represented the Something new! Karon - What a challenge for us this week - Something Old and Something New. I decided to use a lovely image from the older CD Love and Cherish collection - and then used papers from the fabulous new Work and Play Collection 2. The image is coloured up and then layered onto the fabulous papers. and this can be almost anything - you can put your own spin on it! You have until 16th May to enter this challenge which will close at noon GMT. You don't have to use our products to enter, but we'd love it if you did, just please follow our simple rules and add your entry to Mr Linky below!